So the fire alarm has just sounded in your premises. On your way out you pass a man in a wheelchair. He needs help but you are not sure what to do? Do the public have access to the building? If they do, will they be escorted or left on their own? Have you checked with your own staff if they need assistance? Staff or visitors that you know have a disability. It is worth noting that disability covers a large range of conditions not all of which are obvious. The easiest plan is to sit down with your employee and discuss what help they need to get them out. Now you plan for those you don’t know have an issue. During the evacuation, you must complete a sweep to ensure everyone is out. This includes the disabled refuge points (more on these later), on each floor. The evacuation plan must include a process of notification of someone in a disabled refuge point, whether through two-way comms or fire marshalls sweeping through. On meeting someone at a refuge point you must assist where necessary. This may include the use of an evac chair, just holding their arm and supporting or someone who is elderly and needs more time. If the fire service arrives, they need to be informed that the evacuation is ongoing. 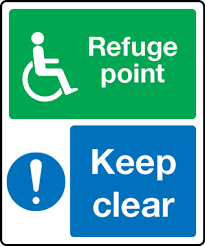 The disabled refuge point; now more built-in design to new buildings and rare in older buildings, these areas provide a safe place to wait until assistance arrives. New buildings will have a two-way comms box and a sign (N9) informing you of how long you may have to wait. Don’t panic is you see 10+ mins as you should be in a fire protected stairwell giving you 1 hour + of safety. These newer buildings generally have a wheelchair size area to wait and will not hinder evacuation of the main body of people.